President Rodrigo Duterte is not endorsing two former senators who were linked to the multi-billion-peso pork barrel scam, but the Palace said Friday he probably felt they didn’t need his help to win. Estrada still faces plunder and graft charges in connection to the pork barrel scam, but the anti-graft court, the Sandiganbayan, acquitted Revilla in December 2018, saying prosecutors failed to present evidence linking him to the millions of pesos in kickbacks that lawmakers allegedly received. The President has endorsed 11 candidates, including Estrada’s half-brother, Senator JV Ejercito. 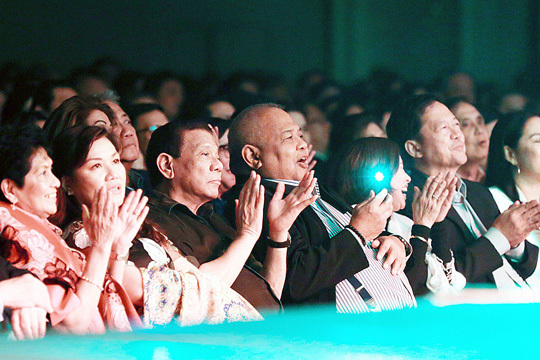 Duterte was expected to include Estrada in his list of candidates after he raised his hands at an event in February, but he later told reporters that he felt obliged to do so out of courtesy because he was there. “He was there. How could I not, even for just one single day, say that I am endorsing 13 candidates? What is that to a friend? We know that he has suffered. We know that he was in prison,” Duterte said in a chance interview. Panelo said the President probably did not want to embarrass Estrada before the crowd. In a statement, Estrada said he respected the President’s decision. “With or without the endorsement of the President, I will continue to be an ally of this administration. My support to this administration is not diminished in any way,” he said. Critics have already questioned Duterte’s endorsement of Estrada as it contradicts his tough stance against corruption. The Palace, however, said Estrada is considered innocent until he is found guilty by the court. As Duterte’sPDP-Laban kicked off its campaign rally, Duterte introduced the 11 candidates that would get his endorsement. They are: Maguindanao Rep. Zajid Mangudadatu; former Philippine National Police chief Ronald Dela Rosa; former top aide Christopher Go; former political adviser Francis Tolentino; re-electionists Juan Edgardo Angara, Aquilino Pimentel III, Ejercito, and Cynthia Villar; Taguig City Rep. Pia Cayetano; Ilocos Norte Gov. Imee Marcos; and folk singer Freddie Aquilar.